I’m using the most recent stable build of Endless on an ASUS X540MA-DM198S laptop (Pentium N5000, 4GB RAM, 240GB SSD) and from time to time (in ~1 hr. 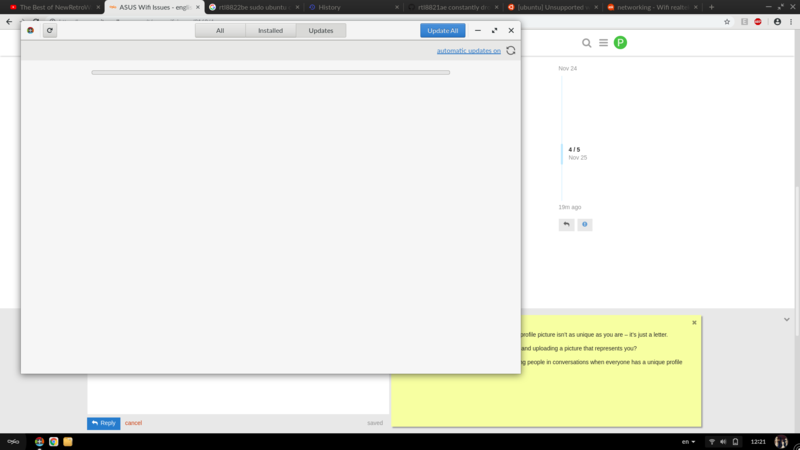 intervals) the Wifi connection gets lost, the notification icon shows that the laptop can’t connect to the hotspot (with a question mark) and no other hotspots are visible (although the list is quite full when everything’s ok). After toggling the wifi on and off it fixes itself for the next ~1 hr. Is there a way to reliably fix this behaviour? For further reference: As per THIS I changed the aspm parameter of the r8822be driver to 0 and haven’t experienced any drops since. The penalty, as far as I’ve read, is a bit increased battery consumption but it really seems minor. When asked for sudo pass, type in your account password. Something new (hopefully not related to the above): in the App Center I see lots of update notifications including one for the Endless Platform. After running the updates, a thick grey line remains where the app listing was - like a placeholder for a progress bar. When I click “Update All” again, in a 4-5 sec. a restart prompt appears. After the restart I encounter the same list of apps and platform waiting for an update. Endless is already aware of this bug are phantom updates the fix is not priority at the moment. @pSy_ZeRo It seems you have already found a workaround for your problem, that’s great. Thanks for letting us know about the problem and the workaround you found. We actually dealt with a similar issue a couple of months ago on a different platform, and at the time it seemed we had fixed it, but apparently we had just reduced the extent of affected machines. We will try to work further with it to find a complete and definitive fix. We may follow up here if we need more information when working on this. To address your concerns regarding updates, configuring modules to be loaded with certain parameters by default, as you did by creating a file in /etc/modprobe.d, does not influence updates in any way (unless of course your changes affect you ability to connect to the internet). You should keep your workaround in /etc/modprobe.d/r8822be.conf for now and system will continue to receive updates normally. Once the next Endless version is out and you are successfully update and reboot, I encourage you to try to remove that file (you can simply move it to a different place) and reboot once more to check whether the problem got fixed, and if not, you can simply put it back in place and reboot again to re-enable the workaround. Ok, will keep you posted, @jprvita A bit of a silly question - how to escalate the file manager to SU access so that I can remove the .conf from the folder? According to the eos-diagnostics, it is bios_version: X540MA.204 in used. The new BIOS can be found at https://www.asus.com/us/supportonly/X540MA/HelpDesk_BIOS/. The latest version is 301 now and worth trying. A bit of a silly question - how to escalate the file manager to SU access so that I can remove the .conf from the folder? You don’t want to run the file manager itself under SU; but you can press Ctrl-L and enter admin:///etc/modprobe.d to get an escalated view of that folder. @jprvita, @wjt, thank you! The BIOS is now current and I removed the Realtek .conf for now… will test how the wireless behaves in the next few days… Seems stable so far. Well… the bug is back - and so is the workaround. I guess that ASPM can be problematic on some laptops. EDIT: To be more precise, this is with ~10-12 tabs open and only ~0,6GB RAM left free (out of 4GB). edit: Reapplied the r8822be workaround, let’s see if that makes a difference.